1922. Published by the Fleming H. Revell Company. Boards are dark burgundy hardcover with impressed design on front, gilt lettering on spine, PO name on FFEP and slight turning of page. Spine slightly cocked. Hardcover, 1992 by Diane M. Stortz and Illustrated by Don Stuart. Happy Day Book Series. Good condition as there is wear at the corners and spine> Media mail without Del Confirmation. 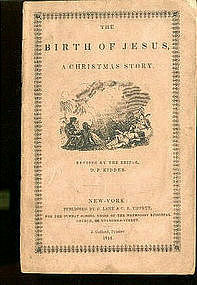 Published by G. Lane & C. B. Tippett for the Sunday School Union of the Methodist Episcopal Church, 200 Mulberry Street, New York in 1844. 16 pages, with spotting but is completely readable.